Greg Morris is a furniture maker and joiner who specialises in creating bespoke pieces. With over 35 years of experience, Greg is able to provide a wide range of services to individual clients and design professionals. 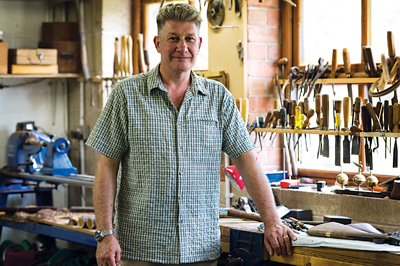 From his workshop, he offers all the skills and techniques of traditional furniture making and joinery to customers both locally and across the UK. Greg Morris: I have several projects on the go at the moment. The first is a restoration job on a cross-banded set of oak (Quercus spp.) drawers dating back to around 1740. Other projects I am working on include an iroko (Milicia excela) worktop for my friend's kitchen and the refitting and lining of a Holland & Holland leather gun box from 1890. F&C: What tool can't you do without? GM: My hands and eyes are the best tools I'll ever have! However, if you mean inanimate tools then they would have to be my chisels. I have around 15, collected over the years from junk shops and car boot sales. The different makes range from Isaac, Sorby and Marples, to Ward & Payne, with sizes ranging from 1.5mm to 50mm. The steel on these old chisels can't be surpassed for maintaining a sharp edge - when finished on my Arkansas stone they could be used to shave with! GM: A small hand-held router for inletting fine inlays and ironmongery. F&C: Nominate a classic piece of furniture from any period - bespoke, mass-produced or studio furniture - and tell us why it's so special. GM: I love country furniture. The kind where a local carpenter has been asked to craft a piece and has had to solve a problem without using orthodox methods. This approach works and the fact that these pieces are still in existence and still loved proves it works. GM: When at school I was offered a sponsorship to go to Ryecotewood Furniture Centre, but I decided not to take it up. Instead I took an apprenticeship at a local joiner's workshop, where I learnt how to use hand tools, sharpen them and look after them. I became a bench joiner and so was born my love for wood and anything made of it. GM: Inspiration comes to me mainly through the needs and desires of my customers who want a piece making for a certain situation in their home. The inspiration comes from their houses, the pieces that they already have and the requirement it must fulfil. GM: Background music that fits with its surroundings and enhances the ambience that's already there. GM: I admire all the smaller furniture makers, particularly those working together to lease old warehouses in London, dividing the space up and sharing the rent, and sometimes the work, when it becomes too much. It's hard to get commissions that pay well and to keep going in this climate when money is tight is to be admired. GM: My mentor is, without doubt, Kenneth S Wilkinson, one of the old boys I did my apprenticeship with. He taught me the basics for everything I do, from sharpening saws to setting out. He was patient and I feel my early years with him were the best foundation I could have had. GM: Design has to come first. When going through the thought process of designing something, you can see in your mind's eye problems that can occur. It's when coming up against these problems that different techniques are used to help you overcome them. Experience helps you see the techniques required to get over these problems. GM: No, I've worked on building sites with so-called tradesmen and if a tool doesn't have a plug on the end they're totally lost - even down to chopping in a hinge. Don't get me wrong, I use power tools but there's nothing better than the sound of a shaving curling out of a finely tuned plane. GM: I have some pieces in Peter Vidal's gallery in Shropshire and recently set up my website. GM: This is no problem whatsoever. It's always good to see new ideas; it widens your horizon and can take you in directions you hadn't thought of before. GM: Basic sketches to scaled drawings - this irons out problems that might occur - and then materials. However, sometimes I find a piece of wood with such wonderful figuring that I build a design around it. GM: Both. I'm a craftsman when I'm doing basic joinery such as making a front door. On the other hand I'm an artist and craftsman when making a bespoke piece and the client has given me a blank canvas. GM: I always feel apprehensive before starting, perhaps nervous that I've missed something. 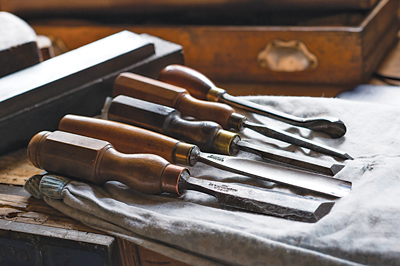 I make sure my workshop is tidy and tools are sharp, which eliminates wasted time when I'm in the zone. I'll sort through the timber, picking out pieces for certain areas like grain and figuring, then I'll cut to rough sizes, sometimes letting the wood sit for a few days to settle. Then when planing up to final dimensions I take even amounts from each side, keeping that tension even and the wood flat and supported. Finally I'll set out the marking joints for each piece. GM: There will always be somebody who needs something bespoke building, whether for utility, for show or both. Manufacturing processes have made furniture cheaper, but there are still people who appreciate a handmade and unique piece. 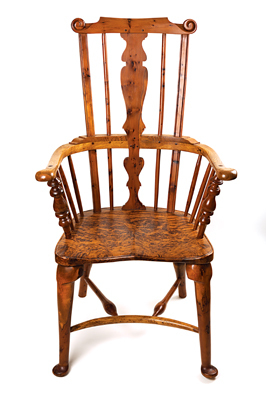 GM: Try and get as much experience as possible; even repairing old pieces of furniture will give you this. 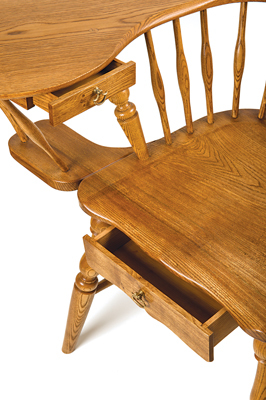 Repairing a drop-leaf table will teach you how a rule joint works while earning a few pounds at the same time. Don't buy every tool on the market; some of the best tradesmen I know use very few tools. A lot depends on your own innovation. If you make your own jigs and marking gauges as you go along, you'll appreciate them more. Get yourself out there, have a stall at local fetes and fairs, show people what you can do. GM: The lack of apprenticeships and tech colleges. We can't all afford to go to private design colleges and some of our ageing furniture makers started as tradesmen with a basic apprenticeship as a carpenter or joiner. I'm sure that there are hundreds of young people out there who are very capable of making most things if given the chance.